The CCTK™ 3.0 software is an off-the-shelf framework for creating customized C² systems. CCTK’s configurable building blocks are used to integrate distributed systems, sensors, and operators for automated and reliable mission operations.. The scalable software architecture is suitable for embedded, headless client/server, or network distributed operation. It is capable of handling millions of data, command, control event, and message transactions each second; while fully maintaining operator situation awareness. Using CCTK™ simplifies and enhances the process of building mission critical command and control systems by providing a working architecture and fungible collection of reusable software assets that when integrated, form the core of any mission critical control system. Systems created using CCTK™ are deployed faster, with less risk, greater reliability, and operability. 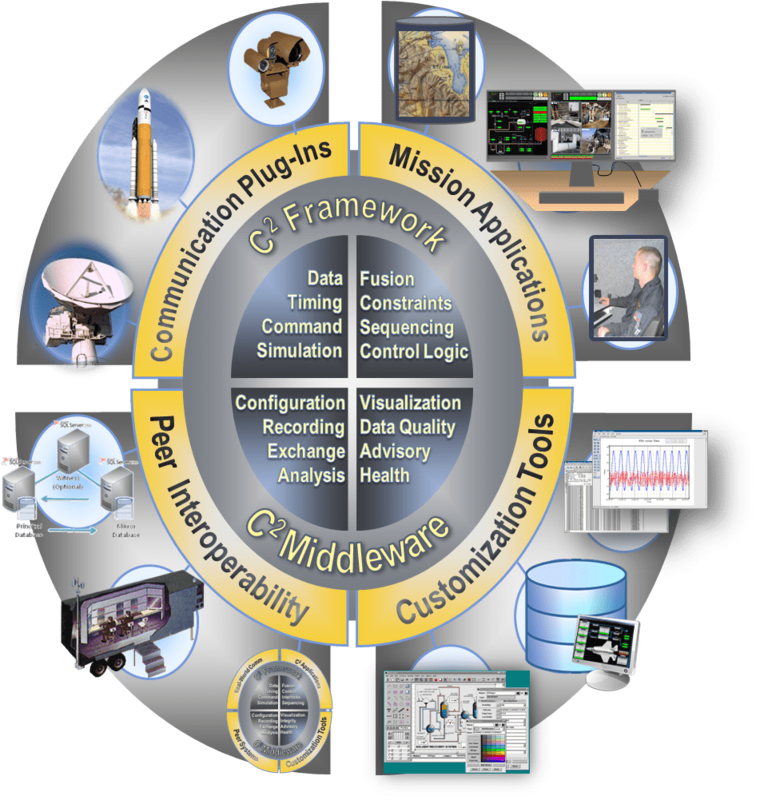 Mission Applications are supported by built-in services for real-time data fusion, commanding, command sequencing, control logic, dynamic graphical visualization, and data & health processing. 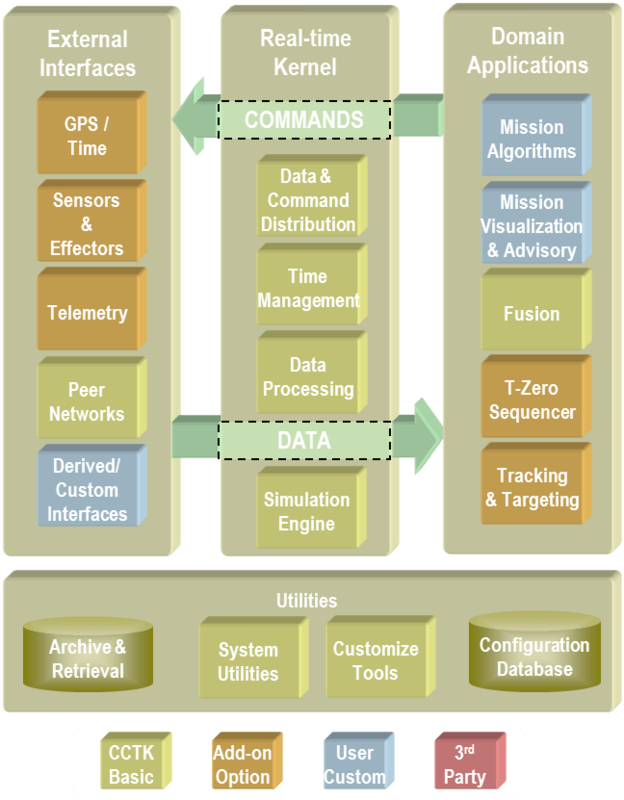 Customization Tools enable the CCTK™ user to create mission specific graphical displays, application logic, Scripts, and configurations uniquely configured for turnkey mission operations. integration of custom protocols and links. All communications plug-ins operate concurrently, enabling fully integrated enterprise control and monitoring. All communications is digitally recorded and integrated with the built-in data retrieval and data reduction tools. Peer Interoperability over standard networks is supported through extensible information model exchange, peer-to-peer communications services, and command and data exchange, fully enabling distributed operations and systems redundancy. Framework providing support for modeling the continuous real-time time behavior of any device, target, or system. Using the simulation graphical user interface, or scripting environment, simulations can be quickly and easily composed in to mission scenarios for: verification of other systems, mission/operation dress rehearsals, operator training and qualification, and validation of processing algorithms.